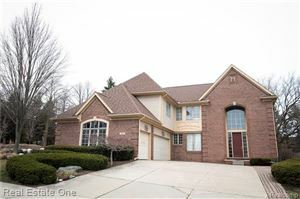 Get away from it all in this Dream Home with Natrl Gas on private road close to Stoney Creek. 5 BEAUTIFUL rolling, treed acres w/ a refreshing Pond. Store toys, equipmnt in 10x30 Det Garage, plus 3.5 att Garage both w/water & electrical. Entertain in your enormous Kitchen or Form Dining Rm or in Walkout Finish Basement w/ full Kitchen, full Bath, Bedrm and Rec area. Continue the fun outdoors on Stamped Deck & Patio. Gourmet Kitchen w/ LaFata hickory 42" cabs, SS appls, blt-in double Ovens, Granite counters, huge Island w/stool bar, roomy Brkfst Nook w/ turret ceiling. Work from home in handsome Office w/ judges paneling, coffered ceiling, built-ins. Spacious 1st flr Mastr has tray ceiling, bay window seat, WIC and ensuite including jet tub,dual sinks. Vaulted Grt Rm has natrl fireplc,skylites and expansive windows/transoms. Upper beds all w/WICs. Solid wood doors, crown mold,expansive REAL hardwd floors thru Foyer,Kit,Dining,Office. Priced well below appraised value! NO ASSOCIATION. The data relating to real estate properties on this website was last updated as recently as 4/21/19 1:43 PM PDT.